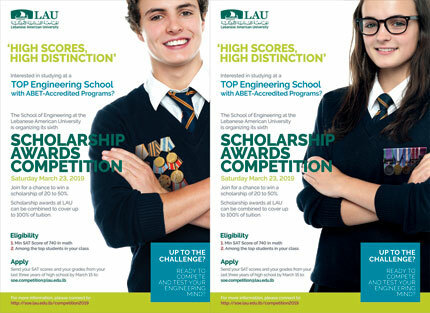 The sixth LAU Engineering Scholarship Award (ESA'19) competition is taking place on Saturday March 23, 2019. This competition will challenge the engineering mind of the brightest Grade 12 students in Lebanon. The competitors have the chance to win up to 50% scholarship awards. These are in addition to whatever scholarship and financial aid they already have. Thanks to this competition, several students are currently studying at LAU for FREE! The LAU ESA competition is a full day event from 8:00am until 4:00pm (Lunch will be provided). Qualification conditions: Minimum SAT Score of 740 in Math AND top ranked student in high school. The deadline for applying is March 16, 2019.